A good trifle needs an interesting soaked-cake layer, enough fruit (but not soggy fruit) and an exceptional custard that is not too runny. I can take or leave jelly, although it is an easy matter to set some of the peach poaching liquid with gelatine if you follow the instructions in basics. For the cake layer, use either a plain sponge cake or store-bought sponge biscuits. These are sometimes labelled ‘Savoiardi’ and are shaped like fingers. They can be used whole or broken into pieces to fit the base of a bowl. I like to use peach leaves in the custard because they give off a wonderful almond aroma when infused with hot liquid. However, they do not impart lasting flavour so I sometimes add a few drops of Amaretto di Saronno liqueur, which is made from the crushed kernels of apricots. If you include the peach kernel in this recipe there will be no need for liqueur as the kernel has plenty of flavour. The small amount of flour in this custard makes it more stable and the flour’s flavour is not detectable. To make the syllabub, remove zest with a vegetable peeler, then juice lemon or lime. Put all ingredients except cream into a basin and refrigerate overnight. Next day, remove zest. (If you prefer the texture, the zest can be finely grated instead of removed in one length, and left in the sweet.) Put liquid and cream into the bowl of an electric mixer and whip until quite firm. To make the custard, bring milk, cream and peach leaves and kernel (if using) to simmering point in a heavy-based saucepan. Remove from heat and allow to infuse for 15 minutes. Strain into a bowl. Whisk egg yolks briefly with sugar and flour, then whisk in warm milk mixture. Strain mixture back into rinsed-out pan and cook over a moderate heat, stirring constantly with a wooden spoon, until mixture thickens and coats the back of the spoon. Cool for a few minutes, then stir in liqueur, if using. Mix wine and poaching liquid and sprinkle over biscuits or cake. Set aside for 5 minutes. Line the bottom of a large glass bowl (1–2 litres capacity) with 6 of the soaked biscuits or cake. Slice 4 of the peaches over biscuit layer, then pour over half the crushed raspberries. Repeat with remaining soaked biscuits/cake, peaches and raspberry sauce. Pour custard over the top. Cover bowl with plastic film and refrigerate for several hours or overnight. Serve trifle as it is, or spoon on lemon or lime syllabub just before serving. 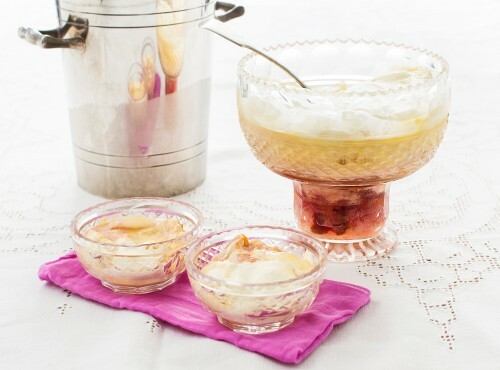 To make individual trifles, divide soaked biscuits (broken to fit serving glasses), peaches, raspberry sauce and custard between 8–10 pretty serving glasses.